Author Interview and Free Book Giveaway! Head over to Lorraine Nelson's blog at http://lorrainenelson.wordpress.com for my author interview! Today, I am beginning my blog tour with Lorraine Nelson, a long time writing friend, and multi-published author. Stop by to read the interview and for a chance to win a free copy of "The Legionnaire's Prize - Caledonia's Captives Book 1" Just leave a comment on the post and attach your e-mail to it, for a chance. Winners will be announced tomorrow afternoon, and I will be e-mailing you to find out the format needed for your e-reader. Have fun, ask some questions, and don't forget to leave a comment for your chance to Win! It's official! The Legionnaire's Prize has been released! The original release date was set for January 25th, but to my great surprise, it was released last Friday the 18th! Want to know a little more? Here you go! Abagail Haber loses her nomadic family and her freedom when a Roman Legion destroys her tribe. Contemplating the possibilities of her future as a slave to the Emperor seems bleak. But when the Emperor marries her to the man who trampled in and conquered her village, Abagail can think of nothing but escaping. Then night falls, and visions of the muscled Legionnaire haunt her dreams. Decimus Cassian wasn't born a Roman; he was made. After 20 years of life under a Roman Emperor, he is ready to run. But, the Emperor has destroyed all his carefree plans by marrying him to his prisoner. How can he convince her that he can be trusted? And how will he ever be able to concentrate on escape when he can't think of anything else but her? How about a revealing excerpt? Decimus cradled her again, closer and tighter. He didn't want it to end, but control was not an option that he had the luxury of any more. He rubbed his hand against her back, gliding softly up and down again. She arched her body into him and he could feel her breasts crushing against his chest. She radiated a sweet smell, and he was reminded again of his true home. Decimus closed his eyes and tried to drown out his subconscious that was ridiculing him for taking part in such an indecent act. It frowned at him and scoffed, showing its disappointment. In the back of his mind, it steadily tapped its foot, trying to make him feel guilty for taking advantage of this poor enslaved creature. However, with the gentle breeze blowing, her scent consumed his mind. The feral man within came to his aid, arguing heavily with his subconscious and ultimately defeating it. He slipped his hand down past her rounded backside, feeling its fullness and warmth. Working his way back up her leg, he slid her robe to the side and allowed his hand to push under her tunic, stroking her bottom, and pulling it forward into him. A moan escaped her lips and Decimus froze, fearing her reaction if she awoke. This was wrong and he knew it. He chastised himself for his savage ways. Within moments, her breathing became regular again. Her body was warm and welcoming. He breathed her in, taking joy in this simple action. The battle within him still raged, unexpectedly rekindled by the threat of her waking. This was his wife. He should take her—now. That was what a woman was supposed to be for. Wasn't it? His body screamed yes, but his mind warned him that this woman was something more. I hope you've enjoyed this small look into the book. If you're interested please stop by BreathlessPress.com and purchase it ON SALE for $1.59. Most format's supported. It's also available on Amazon for $1.99 - Check it out! New Goals and Help WANTED! Remarkably, this has been the longest time it has taken for me to put together a first draft. I've always been quick with my actual writing process, ranging anywhere from 2 or 3 days to 2 weeks. This novella took me 7 weeks to write. I had a wonderful partial outline and jumped right into it. Then came Thanksgiving, Christmas, New Years, and all the wonderful twists that Murphy threw in as surprises. However, I realized the problem wasn't really with all those things. It was with my outline and the way I had intended my story to go. Several changes, "a-ha" moments, and a half complete outline for another book later, I finally figured out my problem. (I wasn't ending it like a romance should.) Note taken, drive on! The last two chapters came to me easily and took me about 6 days to write. Although those days were packed with more of Murphy's little tricks, I still think I could have finished it must faster. I need help from you guys to hold me accountable. START new piece Monday, January 14th. COMPLETE 1st DRAFT - Monday January 28th. SUBBED - Friday, February 1st! Bug me, annoy me, rant and rave, call me an idiot for not doing what I love to do anyhow, pester me about my progress and my book every step of the way. Make me be accountable to you guys to write on track and on target. I need your help guys, and I'll be waiting. New Cover! "The Harvest Queen's Tutor" has a home! 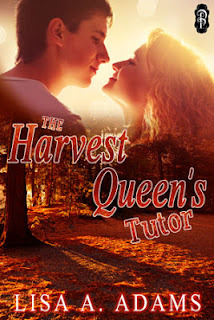 The Harvest Queen's Tutor has a home! Though I do not yet have a release date, "The Harvest Queen's Tutor" has been accepted and has been completely edited for publication. This beautiful cover was my Christmas present this year, as it arrived the Friday before with all of my other wonderful artwork for promotion. The artist did a wonderful job capturing the main characters. Their photo matches almost perfectly the descriptions in the book. This cover was made by Tiggs Designs and the book itself will be published by Decadent Publishing.